Though most web pages pick a reasonable text size, some are just too hard to read because the font size is either too big, or more typically, just too small. Sometimes it’s not the web sites fault though, and a web page that is perfectly viewable on one computer may become teeny-tiny on another display that has a much larger resolution, a huge screen, or a smaller screen. 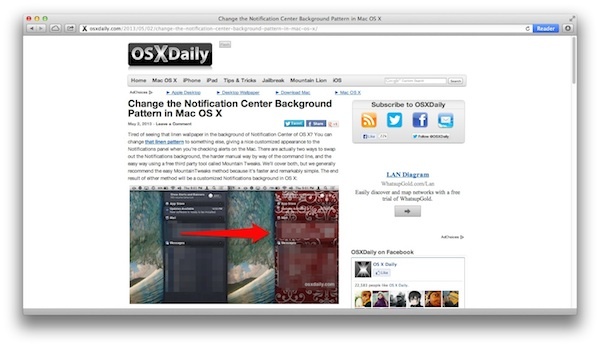 Extreme examples of this are reading many web pages on the small MacBook Air 11″ screen, where text on some pages can be so tiny that it’s nearly impossible to read without zooming, and likewise on an iMac with a 27″ display because the resolution is so massive that some page fonts are just minuscule on the large screen. The obvious solution is to make the text size larger on the web page itself, which makes reading much easier and provides a relief from eye strain, and there are actually two different approaches to this; full-page zooming, or text-only zooming. Let’s cover both. All major web browsers support page-level zooming, including Chrome, Firefox, and Safari. There are both keyboard shortcuts and trackpad gestures to zoom in and out of webpages, and fortunately they’re the same to use with every web browser. For users with hardware that supports gestures like Mac laptops and Magic TrackPads, you can also use pinch and spread motions to adjust zoom level, just like you can in iOS. 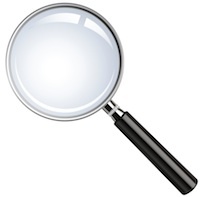 The excellent Zoom feature scales everything on a page, and not only the text on a page, but all web page elements, including images, videos, and even Flash too. This is by far the best approach for viewing web pages on large displays, whether it’s a sizable external monitor, projector output, or when exporting a screen to a TV, since everything visible in the browser window scales up with the zoom level, making it much easier to view. You’re best off trying this on your own and finding a happy zoom level as individual displays and needs see fit, but here’s two examples of what this may look like. Notice how everything is scaled up and down? That’s what makes the zoom approach unique, and different than what we’ll discuss next, which increases the font text sizes exclusively. Some web browsers also provide a separate option to increase only the text size on a web page, rather than zooming in on everything. This can be OK used in moderation, but beyond an increase or two, it usually starts to mangle a webpages visibility by skewing page elements and pushing things around, thereby making the actual site unreadable. For this reason, the “Zoom Page” option is typically better to use, though there are some exceptions. 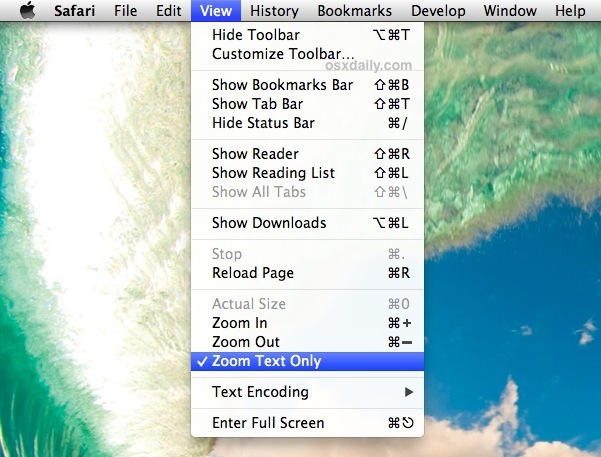 With supported browsers, this must be turned on/off separately as a sub feature of zoom. The keystrokes will remain as Command+ and Command-, but you must toggle the text-only option on before only text is modified. Chrome: Chrome does not appear to support text-only zooming as a native feature, though there are some third party extensions and bookmarklets that will add support for you. iOS Safari: On the iOS side of things you can use use these Safari bookmarklets to increase only the font and text sizes of web pages, without zooming everything as you would with a gesture. These work in Mobile Safari for the iPhone, iPad, and iPod touch. Again, increasing font size only can result in some very screwy looking web pages, and thus it’s really not the best solution. For most use cases, zoom really is the better choice. Whichever method you go with though, don’t be shy to use it when spending a lot of time reading on the web, consider adding Flux to your computer as well, and give those eyes a break! In Safari, I used to be able to hold down Command and Roll the scroll wheel on mouse to zoom, but doesn’t work. I’ve tried several key combination like opt, control, shift.